The 2017 and 2018 editions of the Candor Badminton Championship received an overwhelming response from participants. We take you to the venues where the tournaments reached their smashing conclusion as the players competed for the titles in good spirit. From the standpoint of sheer joy, interest, and challenge, badminton has no equal. The game also brings you closer to health, fitness and fun. Unfortunately, in today’s hectic life, playing badminton or rather, any other sport in general has taken a back seat. 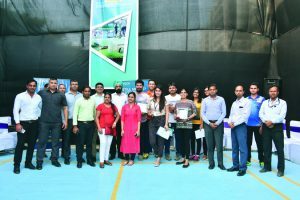 With the objective to help correct this situation at least among the occupants of its campuses, Candor TechSpace organised the first two editions of the ‘Candor Badminton Championship’ in two of its campuses, namely in Sectors 21 and 48 in Gurugram. 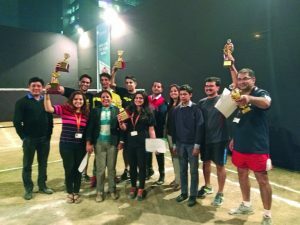 These tournaments were all about giving the participants a respite from their work, and the opportunity to engage with their colleagues in a competitive yet fun environment. Candor Badminton Championship 2017 was held on 27th November at the central lawn next to Amenity Block. Up for grabs in this tournament was the Candor Gold Trophy (first prize), Candor Silver Trophy (second prize) and Candor Bronze Trophy (third prize). Candor Badminton Championship 2018, on the other hand, was conducted on 22nd March at the badminton court near Amenity Block – 4A. 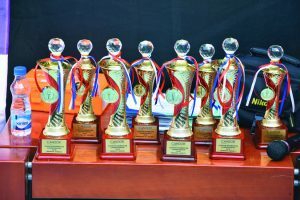 Here, the participants competed for the titles of Candor Gold Trophy (first prize) and Candor Silver Trophy (second prize). Both the chapters of the championship received entries from the different companies residing in the campuses. The meticulous planning that had gone into organising the Candor Badminton Championships ensured that the participants had a fun-filled time playing their favourite sport. The participants put up a spirited show in the tournaments, which were split into two categories: Men’s Doubles and Women’s Doubles. It was indeed a delight to watch the players competing and interacting with each other. The cheering that went on among the audience as the players engaged in back-to-back, nail-biting matches, added to the electric atmosphere at the venues. When the winners were being felicitated, they appreciated the efforts taken by Candor TechSpace towards promoting a healthy lifestyle among the occupants of its campuses by organising the Candor Badminton Championship 2017 and 2018. So, who’s game for competing in the next chapter of the championship?